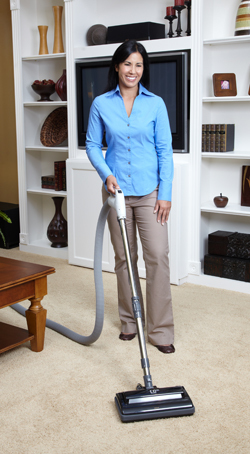 Cleaner, Healthier and Easier: have you ever heard all 3 used in the same sentence to describe vacuuming? Dirt Devil’s Cyclonic Filtration Technology not only provides 5 times the suction of a portable vacuum but also helps keep the air you breathe cleaner. This vacuum captures 100% of vacuumed dirt and allergens and places them in the containing canister outside of your living space instead of recycling it into the air. Hide-A-Hose: Why didn’t somebody think of this sooner? Dirt Devil’s revolutionary Hide-A-Hose model stores up to 50 feet of hose in the wall. No more lugging heavy hoses from outlet to outlet. Simply pull the hose out from the wall, connect the cleaning head and you are ready to go. When you are done the hose slides easily back into the wall for storage. VROOM Solo: Need a quick clean-up? VROOM is a compact self-contained unit that fits under most standard cabinets and is perfect for small everyday messes. A retractable 24-foot hose and an auto-start feature make it the perfect complement to a kitchen, bath or laundry room.